We will start at Canada Cruisers Canada Cruisers and The Hardball HardBallCafe in Milton, Ontario. We will set up 5 destinations (to be kept secret till the run starts) where we will have victims of ALS and their families handing out the playing cards. The play area will be between Toronto, Orangeville, Kitchener, Cambridge and Burlington. This is a beautiful area where the Niagara escarpment runs right through which should make for some very enjoyable riding. Obviously the player that returns with the best hand wins and we are planning on having some great prizes. 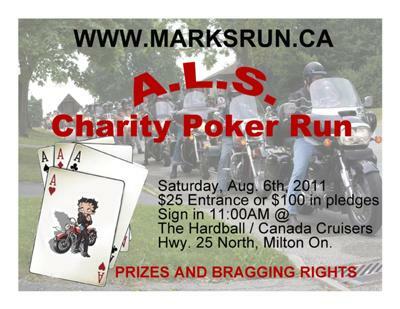 Following the poker run, we will be having many activities including a charity silent auction as well; we will once again be putting on a BBQ.